a lot of griping about the sound quality on this one, but it sounded fine on the shop stereo at my work (i work in a record store, the owner took a lot of care with the sound system). whoever did this put some effort into it. nicely printed sleeve and insert, repro labels that look good and clear. my copy wasn't one of the random ones with the repro postcard, but my original pressing didn't have one either. for the 15 dollars it cost me, i have no qualms. i'm not holding my breath for a legit repress. But the one with postcard has a matte printed inner, while the one without the postcard is glossy. Can anyone comment on what their inner is? I'm curious if that is the best way to tell if it is a first press without postcard or second pressing. What is written in the deadwax? We need matrix numbers, etc. 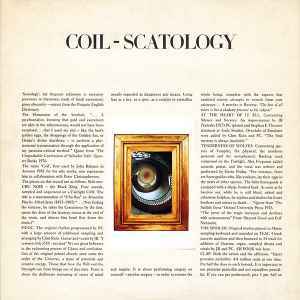 If your initiation into the work of Coil consists of later classics like "Love's Secret Domain," the "Unnatural History" compilations, or the "Musick to Play in the Dark" series, you are likely to be surprised by this early effort. This is not to say you will be disappointed, far from it. In fact, you will come to appreciate their work more by seeing yet another example of the variety of sounds they are capable of. Unlike the atmospheric and abstract tendencies of the Moon Musick stage of their works, Scatology reflects Coil's connection to Throbbing Gristle in the album's aggressive, feedback-driven noise sculptures. On the other hand, the uniqueness and the highly mystical, surreal, sometimes diabolic outlook of Coil is exhibited in full even this early in their work. Much the same can be said for their artistry and reflectiveness; every song has a definite meaning, which is elaborated on in the CD booklet, a helpful companion to the music indeed. The impressive variety of themes explored therein range from the perverse to the profound, and sometimes one can't tell where one ends and the other begins. Each page is peppered with quotes by sources ranging from Dali, to Dawkins, to Charles Manson and even an Archbishop cautioning the faithful against spiritual delusion. As for the music, this wide thematic range is reflected there too, paralleled by a wide range of sounds, moods, and textures. A whimsical collage of jazz and symphonic samples with cut-up speech opens the album. This is then followed by an elegantly chaotic dancefloor piece "Panic." A couple of ambient but lively pieces with esoteric themes follow, one of which features gothic legend Gavin Friday crooning poetically about psychic vampires. From here on, the album can best be described as noisy and intrusively rhythmic enough for the industrial set, but with the right amount of melody, strange passion, and eerily ethereal resonance for the gothic set. Orchestral sounds intertwine with oppressive mechanical rhythms and the cryptic waveforms for which we know Coil's synth work. These seemingly disparate sounds form an order in their unique way to serve us as a soundtrack to apocalyptic visions, mass hallucinations, the latent perversion in man showing itself, and a famous vision of the notorious de Sade. Finally, while it seems odd to close such an album with a cover of a cover, Jhonn and Peter don't fail to put their unique touch here either. By some form of poetic alchemy, a sentimental song about the strife of love becomes a revelation of the invasion of love by a then-obscure plague. Indeed the exploration of the dynamic between love and death has always been a major aim of Coil's work. This album proves that as surely as more famous later works do, and will serve as a great intro for the newcomer and a new enrichment for the longtime fan. what is written on a matrix? my high-end turntable wondered by this "masterpiece"
DONT BUY UNOFFICIAL RELEASES YOU MORONS. Sound quality is not super, certainly not worth the cost nor the shame.